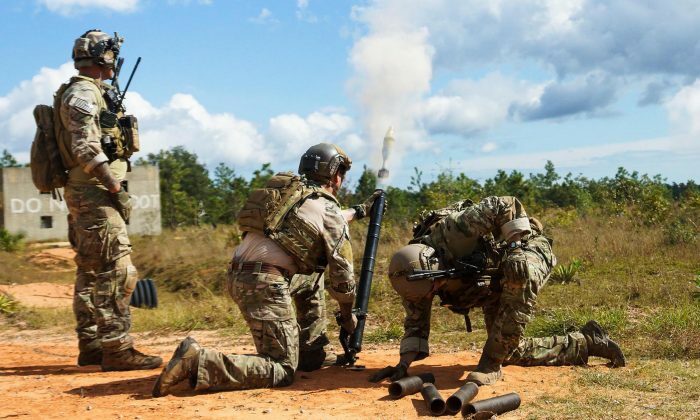 U.S. Army special forces during a training exercise at Hurlburt Field in October 2014. In the coming weeks, the Pentagon is looking to push ISIS forces out of Syria and Iraq by upping the number of U.S. Special Operations it currently has deployed there, according to a CNN report. Officials told CNN that the White House discussions to move the Spec Ops forces into the Middle East could come as soon as April 5. The intended plan would be to supply on-the-ground pressure focused on reclaiming Raqqa and Mosul. The intended plan would be to supply on-the-ground pressure focused on reclaiming Raqqa and Mosul—choking ISIS’ ability to use them for planning centers. The military’s current plan allows up to 50 Spec Ops teams to be in Syria, aiding Syrian efforts against ISIS. So far, the United State’s aid in these efforts have proven to be effective, cutting ISIS travel to Raqqa and Mosul, and retaking Shaddadi. However, these operations are extremely dangerous—requiring small teams of Spec Ops forces to work far from their Turkish-border Syrian bases. An increase of U.S. troops would mean an increase of transportation and support, which could hinder the visibility and blow the cover of the missions. The United States hopes Syrian forces, as well as members from Syrian’s Democratic Front, including non-Arab fighters, will be able to reclaim the ISIS-declared capital of Raqqa—with the advisement of the U.S. military. With that goal in mind, the U.S. military has again put forth their small training programs for Syrian fighters, with higher expectations since the first try initially failed a few months prior. Basic training for these hand-picked fighters includes being able to radio over transmissions with U.S. forces when spotting targets, and calling for the U.S. teams to monitor and access strikes.